There have been some large improvements in physical advertising recently, for example physical displays, or kiosks that you might see at a shopping mall or gas station. These kiosks would formerly only have been able to place a single poster or other physical advertisement in their display, but now with the introduction of digital displays they can rotate multiple ads in the same physical space. And in addition to this, often times the displays can integrate video or rich media as well, greatly increasing the effectiveness of the advertisement. Despite these improvements however, they remain generally static and passive, meaning their effectiveness is still lacking. In order to achieve such a physical advertisement’s potential a QR code can be added directly into the digital media. The addition of a QR code, if properly applied, means the potential target audience can now engage with the brand, and be alerted or connected to any related content or promotions at the moment the advertisement is most likely to have piqued their interest. Not only this, but they can now take the brand/promotion with them on their smart phone and continue the interaction (perhaps through an app) or ensure a later purchase. 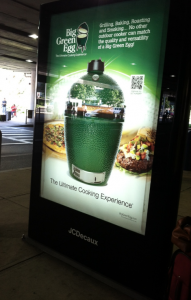 For example, say there was a digital display on a kiosk in a mall, and the display included a QR code. Next to the QR code in large writing a call-to-action might clearly tell potential customers that if they scan the code they will receive a coupon that is usable only for that day. The customer can then scan the code and take the coupon with them to said store in the mall and make a purchase that they otherwise might not have made. If this particular code is a dynamic code then new coupons/specials can be offered every day and the QR code can be changed to meet whatever the needs are of a specific day. Perhaps a store has an abundance of inventory for jeans, the QR code coupon could be changed to offer a buy one get one, or a special discount for those scanning the code on that specific product etc. Adding QR codes and using them in this sort of way to capture customers attention and provide them with incentives to make additional purchases is the best way to make a physical advertisement live up to its potential and drastically increase its value. 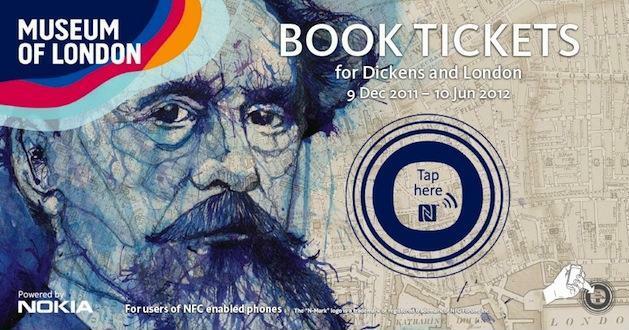 Don’t lose out on this sort of additional value your ads could be providing, use QR codes. But also use them well. We’ve launched a video showing how Qfuse can be used as a mobile website and landing page builder. Check it out below! Here’s a transcript of the video. Qfuse makes it easy to produce great-looking mobile websites and landing pages that are optimized for display and performance on smartphones, like iPhone, Android, and Windows Mobile. Quickly customize your mobile landing page to match your brand by uploading your logo and customizing your color scheme. Choose a mobile website template from our template library or define your own custom style with a few clicks. Create mobile pages with text content, image galleries, videos, and social media capabilities. Qfuse also makes it easy to add interactive features to engage your users, such as click-to-call buttons, customizable contact forms, and GPS mapping with Google Maps. Best of all, Qfuse has industry leading real-time analytics to show exactly how your mobile pages perform and what visitors do on your site. Whether you’re a small business that needs a simple mobile-friendly version of your regular website, an agency that needs to efficiently build and manage thousands of mobile landing pages for your ad campaigns – or anything in between – Qfuse has you covered. Let us know what you think of our latest video below! Mobile has been largely adopted by consumers, and yet it has taken marketers a few years to catch up, or really to even put themselves in the race. The numbers though are getting to a point where marketers must take this increasing gap seriously. According to data from IBM’s Digital Analytics Benchmark, mobile traffic is driving 25% of total online traffic to retail sites, is accounting for more than 20% of all online sales, and mobile sales are up 55% over last year with exponential growth appearing very likely. According to the Forbes article, the average firm invests only two to three percent towards their mobile budgets, but the leading mobile firms are beginning to increase their mobile budgets to 10 or even 25%. Indicating that some firms are finally starting to take mobile as seriously as they should. As Jay Henderson, Strategy Program Director at IBM, states in the Forbes article, the best strategy for firms is “to take a ‘mobile first’ approach,” and he “encourages marketers to build mobile sites form the ground up, rather than force fitting an existing website into a smaller format.” This is also what we would advise at Qfuse. This is an important point, because rather than viewing mobile as separate and relatively insignificant, it should be viewed as vital to how business will be done in the near future, and integrated into the overall business plan. As Henderson is quoted in the article, it is forward thinking marketers that “are investing in their mobile apps to include maps of the store, special promotions, and location based targeting. Companies are adding QR codes and NFC to their in-store display to help bridge from physical to mobile.” These sort of integrated plans will go a long way for the firms which implement them earliest. Helping to increase in store sales, prevent lost sales from showrooming, helping increase brand interaction and awareness, and simply creating a better experience for the customer. For marketers, 2014 should be a year of transition to mobile, and a year of mastering mobile technology and its existing tools. Creating a strategy to build mobile from the ground up, and then connecting mobile to your physical marketing plan—through tools like QR codes, NFC tags, and mobile apps—will greatly increase the efficiency of the overall marketing strategy and enhance the end objectives. To read more on this issues check out the Forbes article here, and to get started on, or improve upon you existing mobile strategy, check out Qfuse here. With the ever exponentially growing mobile usage it can be difficult for companies to keep up, and in fact few are. This means that if a company can quickly move to mobile, and do it right, they can potentially find themselves filling that market hole over their competitors and reaping significant rewards. As you will see in the Infographic below, brought to you by Surge, you will notice that as of 2014 mobile web browsing will account for half of all browsing. If half of web usage is on mobile, and you aren’t—or you are only dipping your big toe into the mobile waters—then you are missing out on connecting with half of the entire market. It should be pointed out that it isn’t JUST about getting onto mobile, more importantly it is about doing mobile correctly. This means ensuring your mobile optimized site functions flawlessly since “46% of consumers are unlikely to return to a mobile site if it didn’t work properly their last visit,” and if you site takes more than 5 seconds to load, 74% of users will leave the site. Advertisements or search results that mention a location also see a 200% increase in click-through rates as mentioned in the infographic below. This means that if you are not doing mobile correctly, it might be as bad, or even worse, than not doing mobile at all. In regards to e-commerce one in five smartphone users scan product codes like QR codes to access information or make purchases. This means that using things like QR codes or NFC tags might help ensure you capture a greater number of sales than you otherwise might without these codes on your physical marketing or packaging. The future of mobile around the world looks promising, and the growth is very much exponential. So take a look at the infographic provided by Surge, consider where you and your company’s mobile strategy currently stands, and begin to develop a plan and make the necessary changes to match where the mobile market future is headed. You will be far ahead of the competition. As a brand it should be your goal to try and have customers interact with said brand as often as possible, and that such interaction is of high quality. Doing this means greater familiarity is built between the customer and the brand, and it can in time create a sort of emotional tie between the two, this in turn should then help to increase future sales. One problem is finding a means to connect with customers and entice them to interact, luckily a simple tool exists to help ensure this interaction: QR codes. A recent personal example might help illuminate how this sort of interaction can be done using QR codes as your tool to accomplish the goal. I had purchased a bottle of the wine Yellow Tail and when I proceeded to open it later that evening I saw that on the back label there was a QR code. Unfortunately there was no call-to-action (I will discuss this later), but considering I write about QR codes regularly I figured I would scan it and see where it took me. Surprisingly—considering their lack of a call-to-action—I was impressed with what I found. Not only were they getting the technical aspects down—their page was mobile optimized—but they had a great way to incentivize customers to interact with their brand in addition to providing them with information that might also want. 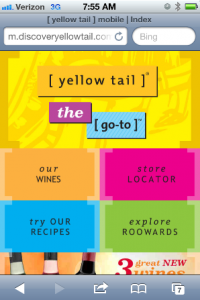 Besides having a store locator, a list of all their wines, and a favorite recipe list, most importantly they had a rewards section where you could save Yellow Tail bottle caps and get points that you can accrue to buy various Yellow Tail swag. This is a perfect way to incentivize customers to interact with you brand and feel like they are getting something in addition to just the particular product they are consuming. 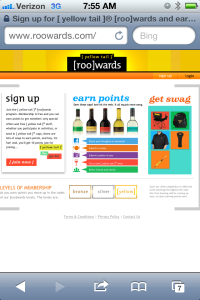 This sort of interaction and rewards program is a great way to create a loyal customer who will more than likely make future purchases. 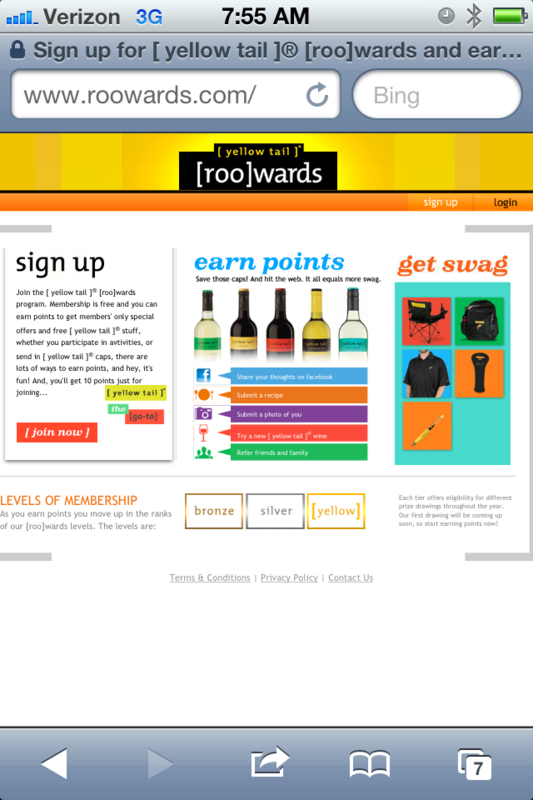 The only problem I found here is that lack of a call-to-action adjacent to the code (i.e. giving customers a clear reason/incentive to scan the code). This is a very big problem however, particularly because everything else was done so well. If you are using a QR code then it is obvious you would also want people to actually scan said code. But most people are not going to waste the time scanning the code if they are not guaranteed to find something of interest on the other end. Having a QR code without a call-to-action fails to provide the information most people need if they are going to decide to scan your code. It is vitally important, particularly if you have something as great for brand interaction as a rewards program, to explain what the benefit is to scanning said QR code. Convince people to scan the code, tell them why it is worth their time, and make sure it is. Once this is done, and they have also been provided with positive brand interaction, said QR code campaign will be a success. QR codes can be a great tool to reach many objectives, but whatever your reason for using them, just be sure you are using them correctly.